Cook the potato, rinse to cool and set aside. Slice and fry the shallots in a little oil until golden brown and set aside. Steam the cabbage and green beans. Cool and set aside. Prepare the rest of the vegetables. Assemble the salads in this order: potatoes, cabbage, carrots, sprouts, green beans, cucumber, and jicama. 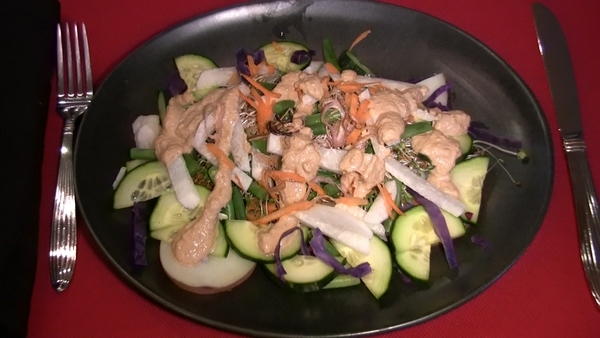 Pour 2-4 tablespoons of peanut sauce (or as much as you desire) over each salad and scatter shallots on top. Extra sauce will keep for several days covered in the refrigerator. Optional or additional ingredients: fried tofu or tempeh, cauliflower, bean sprouts or spring greens.